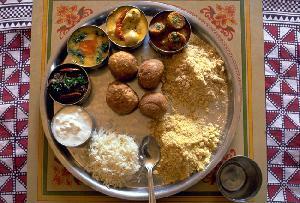 Cuisine of Rajasthan, Rajasthani Cuisine, Rajasthani food. Rajasthan is well-regarded as the beautiful land of vibrant colors, wonderful palaces, attractive architecture and tasty cuisines. The environmental and social aspects have played a huge role in molding the Rajasthani Cuisine to its present from. Owing to the geographical location of Rajasthan, water is scarce and fresh green vegetables are not easy to get. 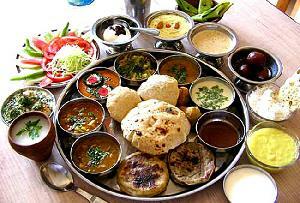 As a result, most of the Delicacies of Rajasthan are cooked with the minimum quantity of water. Milk, clarified butter and buttermilk are used in generous quantities in the preparation of Rajasthani food. Dried lentils as well as beans from local plants like Ker, Sangri etc are utilized in Rajasthani Cuisine quite liberally. Gram flour is one of the key ingredients that's used to cook some of the lip smacking Rajasthani food such as Pakodi, Gatte Ki Sabzi and Khata. Mangodi and Papad prepared from powdered lentils would also be a treat for your taste buds. In many regions of the State of Rajasthan, Bajra and corn are utilized to prepare delicacies such as Khichdi, Rabdi and Rotis. Amongst the Delicacies of Rajasthan, sweets are a significant part. Each area of this desert offers its own special sweet dishes. For instance, in Pushkar, you can taste the delectable Malpoas while Jodhpur offers Mawa Kachori. Tasty Rasagullas are the forte of Bikaner. Bati, besan ki missi as well as lacchedar paratha are different types of breads that are a big draw amongst the tourists coming to Rajasthan. Some other Popular Rajasthani Delicacies consist of some meat preparations that make use of cashew nuts, coconut, and some typical Indian spices like turmeric, cinnamon, garlic, clove and cardamom. Various types of chutneys are also an integral part of the Cuisine of Rajasthan. Most of these are made from local spices like turmeric, coriander, garlic and mint. One of the most prized Rajasthani food is the combination of dalbati and churma. However, if you are an adventurous traveler who is not scared to experiment and travel that extra mile, there are several other delectable varieties in store. So, rush to gorge on the mouth-watering Delicacies of Rajasthan and permit your taste buds to get enthralled by the sheer diversity of the food on offer. Indeed, savoring the various dishes classified under the Cuisine of Rajasthan would offer an enchanting gastronomical experience for you.